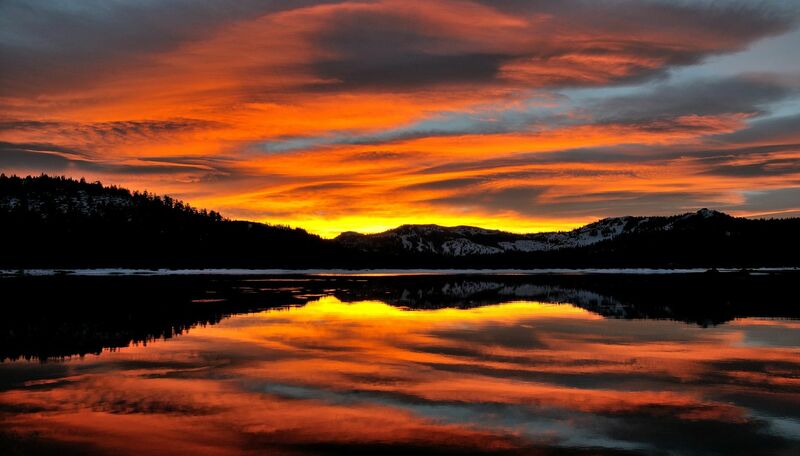 You have probably seen this iconic image of a sunrise at Van Norden Lake. 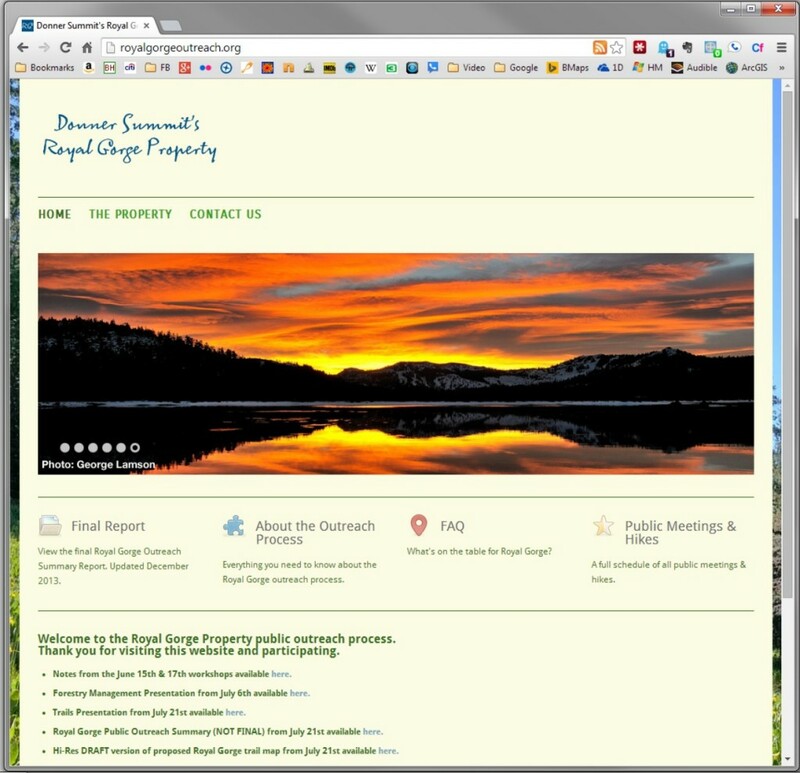 If you don’t remember where you saw it, here it is on the web page on the Truckee Donner Land Trust (TDLT) Royal Gorge Outreach website. It was just one of many of my photographs of Van Norden Lake that were used by TDLT in their fund raising and outreach program for the Royal Gorge Properties. No one supported their cause to conserve the Royal Gorge porperties more than I did. The promise was that the lands would be preserved and saved from development for the enjoyment of all of us. Implicit in that promise was that the Summit Valley including Van Norden Lake and Meadow would be preserved as the beautiful natural resource that it is. That was reinforced by many other images on their website and in their fund raising material like the image of the lake that is the current banner on their Facebook page. How many times did I hear in speeches by various “conservationists” that the lake and meadow were going to be preserved. 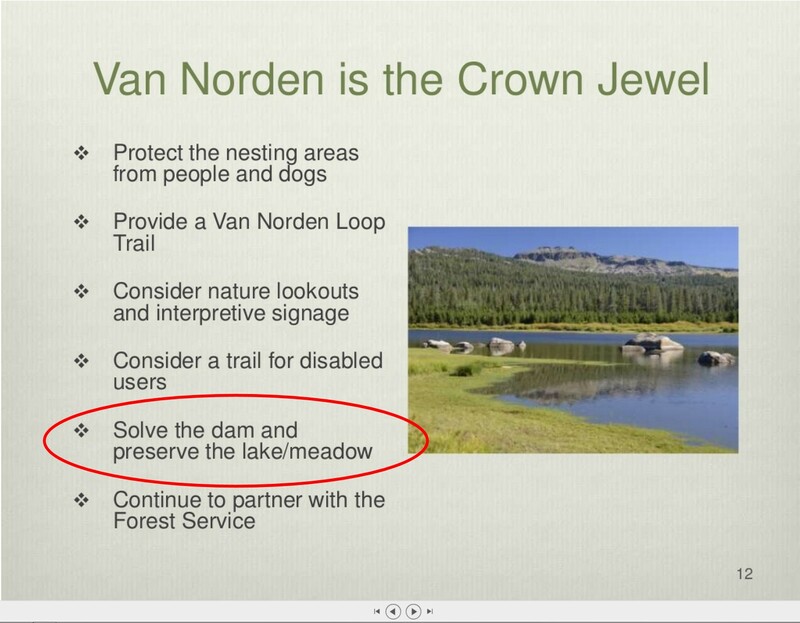 There was also the slide in their presentation on the “Crown Jewel of Van Norden” in which they explicitly set the goal for preserving Van Norden Lake. This week we learned of the SWITCH. TDLT revealed their plan for “fixing” the Van Norden Dam. The “fix” is to remove the Crown Jewel, Van Norden Lake. They plan on notching the existing dam 5 feet which will effectively drain the over 100 acres of lake and wetlands area down to a 2 acre puddle. This drastic move will remove the most biodiverse habitat in the Summit Valley as well as one of the most scenic landscapes in the Sierras. The purpose of this site has been to preserve as much of this natural resource as possible and we were hoping to save most of it with our two lake solution. TDLT claims that they are doing this because the lake poses a public safety risk and there is an issue over water rights. This doesn’t make sense in light of the fact that they have shown in their own studies that they can lower the dam 2.3 feet to reduce the volume the lake to less than 50 acre-ft which will remove it from state jurisdiction and still maintain about 30 acres of lake and 30 acres of adjoining wetlands. The 50 acre-ft limit has been implemented by the state because they do not consider lakes below this limit of being a risk. With regard to water rights, the lake has been in Summit Valley for over 100 years and its current configuration for over 35 years. There was never any water rights issue before. And why did TDLT pay $10,000 to SLCWD for them to grant water rights to TDLT for the Summit Valley? It is much more likely that the motivation for this drastic plan is the pressure put on TDLT by the US Forest Service. The Forest Service is planning on acquiring the land in the next two years and have told the Land Trust they do not want a dam on the property. I think part of this is bureaucratic expediency and part is the current “trend du jour” in the Forest Service to remove dams. It is true that there are many dams in the US today that really don’t provide value to the environment and could be removed. Unfortunately, this trend is also effecting dams that actually enrich otherwise less bio-diverse habitats such as Van Norden Dam. There has been a rush to restore meadow habitat in the Sierras after exploitation from logging and mining. In the case of the Summit Valley, however, there is a thriving meadow habitat in Van Norden Meadow that is complemented by an equally thriving alpine lake and wetland habitat that is even rarer in today’s mountains. It is hard to understand the logic in removing the rare and bio-diverse lake/wetland habitat and replace it with a less bio-diverse habitat that already exists in the majority of the Summit Valley. The idea that this valuable habitat should be lost so that the Forest Service won’t have to worry about maintaining it is even more troubling. The bottom line for us is that the removal of Van Norden Lake goes against every intention that the whole effort to preserve the land engendered. The reason the lake was such good bait is because it is indeed the Crown Jewel of the Summit Valley in so many ways. Removing the Jewel will diminish the natural experience for all of us. We intend to fight this short sighted move and would welcome any support in this endeavor. Please contact us if you would like to help. Also see what you can do. Thanks for bringing this issue to my attention. Feels like TDLT has been disingenuous about its motives regarding Van Norden Lake. Is there a mechanism to prevent them going forward with removal of the dam? To be fair TDLT probably had the best intentions in mind when they first acquired the property. Unfortunately, they seem to have become much more pragmatic in the last year and have lost focus of what this acquisition was all about. Fortunately, the state of California has the CEQA process in place to review moves like this. I wholeheartedly support the Land Trust’s plan. There was no bait and switch. They said they would study the problem and make the best decision after weighing the evidence. I believe that’s exactly what they have done. I can’t wait to see the landed return to a more natural state. Wouldn’t expect anything different from you Dan. Unfortunately, they are not making the “best decision after weighing the evidence”. What they are doing is making the evidence fit the decision that the Forest Service wants so they can sell the land. As far as “natural” goes. Nature adapts to the environment. Enrich the environment with a lake and wetlands and in the over 100 years that the lake has been there, nature has brought the birds, amphibians, mammals, fish, and vegetation to establish a much more diverse ecosystem. I don’t think the wildlife currently inhabiting the lake and wetlands feel unnatural. There are communities all over this country spending millions of dollars to create and restore wetlands, all in a effort to increase bio-diversity. What could be more natural than that? There is a thriving alpine meadow habitat currently in the Summit Valley. The lake and wetlands are a fortuitous bonus in providing additional habitat that further enriches the valley. Nature will quickly adapt back to the new state as well. Van Norden will continue to be a healthy ecosystem supporting native wildlife with both wetlands and meadow. I’m no expert on this matter, but, without strong evidence to the contrary, I trust the folks who have heard many more expert opinions on this matter to make the best decision given the evidence. This argument that the Summit Valley will be better off if it goes back to the way it “used to be” completely misses the point. Of course nature will reassert itself. Without the lake water it will remove the wetlands and all the fauna and flora that depend on them. We know exactly what the valley will look like because the majority of it is already seasonal meadow. You just have to look at the old railroad images of the valley taken before the lake was there to see what the valley will look like. There were no wetlands. The point is that through a very serendipitous set of events, there is a unique shallow lake out there supporting a thriving wetland habitat that enriches the whole valley. Ah to live in that perfect world where decisions are made based on facts and evidence. Too bad we all live in this world where many decisions are made based primarily on politics and/or money. As a working scientist for 30 years I have no illusions of how evidence can be manipulated by “experts” to support a decision. I am aware of no “evidence” that the valley would be better off without lake and wetland and a wealth of evidence on the value of this type of habitat. It’s hard to trust in evidence when you know the answer before you do the studies. TDLT told us over a year ago that the Forest Service refused to buy the property with a lake on it. Is it a surprise that they decided to remove the lake? This has a lot more to do with money than science. Thanks for your comments Dan. They give me a chance to really flesh this issue out. Great idea, Dan – getting rid of the dam at Van Norden. Maybe the dams at Serene lakes, Cascade Lakes, and Kidd could also be removed. And why not the one at Donner Lake also. Who needs these lakes, wetlands, and extra water storage in the Sierra, and the wildlife that depends on them? Let nature – and global warming – take its course. I agree as stated above this really is just boiling down to politics and money. None of the agencies involved are making their decisions based on what the local people want, or whether or not it is good for the flora and fauna, flood control, recreation, community assets, etc. whether it is a meadow or a lake. There is always a third side that would work for both parties and I feel both the Forest Service and Land Trust need to work with all of us a little better to find that synergy so important for a unique community such as ours. Also California has changed their views on water storage in these last few drought years. I feel there is definitely a way to keep both our beautiful lake along with the georgeous meadow where everyone can be happy. And yes the land trust did change what they were claiming their original plan was before we all donated.